An easy subject at which very few excel! I came across this gem at Brad Delong’s website, where he is having a dialog with Paul Krugman about the use of graphs in Econ 101, and specifically whether Production Possibilities and Edgeworth Boxes should be introduced at the introductory level. This is certainly a conversation we are having on our floor. I think we generally introduce PPFs, but not the Edgeworth Boxes in our introductory courses, and our Econ 300 students get the Ysidro Edgeworth treatment. I guess I’m all ears if you have thoughts on the topic. That’s from his obituary for Alfred Marshall, author of the incredible Principles of Economics, the profession’s first textbook, and namesake of Marshallian Demand! Truly a pioneer and an intellectual giant, regardless of what Keynes says here. It’s nice to see someone say something nice about economists, even it if is an economist, and even if it was 90 years ago. This week seems to be innovation week for me, as I am reading two short books on the heels of The Great Stagnation. Reading these pieces, I can’t help but get the feeling that the economics profession is hurtling into a blog-soaked, pamphlet-era frenzy. First up for Econ 100 is Alex Tabarrok’s Launching the Innovation Renaissance (review here), where Tabarrok makes a case against patents, holds out promise for prizes, and makes a plea for broad educational reform in both primary and secondary education. For the Reading Group crowd we have Erik Brynjolfsson and Andrew McAfee’s Race Against The Machine: How the Digital Revolution is Accelerating Innovation, Driving Productivity, and Irreversibly Transforming Employment and the Economy, and with a subtitle like that, who needs a description? As a warm up to Renaissance, here is Tabarrok giving his TED lecture. Here’s a bit on education. (If you follow all the links at Marginal Revolution, you can pretty much read the whole book). Here are Brynjolfsson and McAfee summarizing their argument in The Atlantic. See also Professor Finkler’s recent plug. I’ve read both and recommend both. We’ll see what my Econ 100 students think. Thought provoking all around. This past week in 100 we tackled the unusual welfare economics and the effects of price controls. For introductory economics courses, rent control and minimum wage policies generally serve as the dominant examples of controls that mean well, yet have perverse impacts. 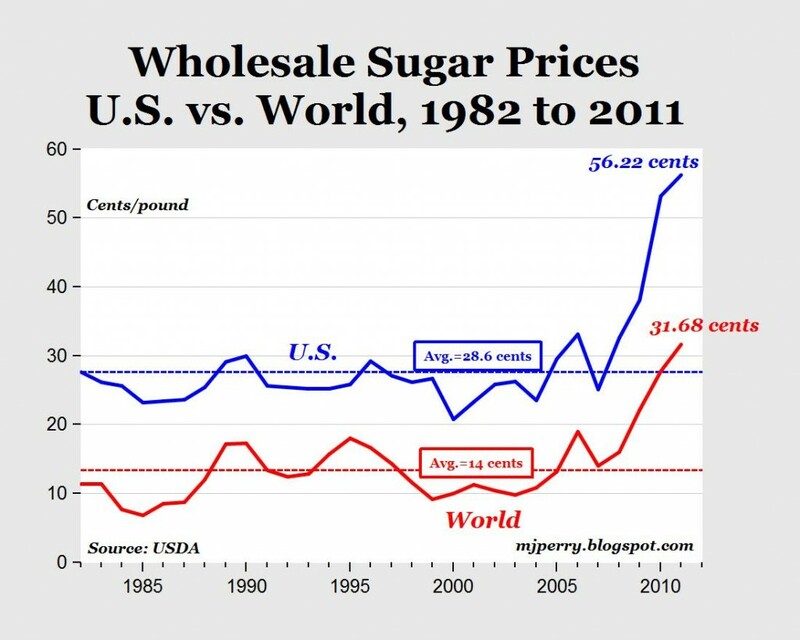 But I’ve always had a soft spot for the U.S. sugar program, which continues to surprise and astonish. As you probably don’t know, but might suspect, the average U.S. citizen consumes about 140 lbs of sweeteners per year, about half coming in the form of sugar and the other half in the form of some sweet corn goodness. Because of import restrictions, however, U.S. consumers pay a rather steep markup over world price. In class I cited a 2010 article where U.S. prices were about $0.35 per pound compared with $0.20 on the world market. If you take $0.15 per lb. times 70 lbs. times 300 million people, you’re starting to talk about real money. But on a trip over to Mark Perry’s blog, I see that sugar prices have gone absolutely bonkers in the past two years. Perry has a nice figure that shows the markup is now more like $0.25 per pound, meaning that sugar producers are now really going to the bank. Perry estimates that with the markup, U.S. consumers pay about $3.5 billion more for sugar than they would absent the quota. Although that is certainly a tall number, on a per capita basis it only comes to about $10-$12 per person. On the other hand, the U.S. sugar producers pocket a healthy chunk of that $3.5 billion. Face it: Sugar is given away for free in restaurants, where they charge you for water, they charge you for an extra slice of cheese on your hamburger. The sugar is so affordable that it’s given away for free. That’s because American sugar policy works. Do you suppose sugar would still be “given away for free” if the U.S. price was cut in half tomorrow? UPDATE: For some background, here’s a Congressional Research Service report — usually readable, often helpful. For those of you trying to master the difference between movement along and shifts — introducing Art Carden! Alex Tabarrok talks to NPR about the story he uses to motivate his 101 class at George Mason. It is a tale of the English shipping their prisoners off to Australia, with the sorry result that many of the prisoners perished during the sea voyage. Yikes. How could they have prevented this sorry fate? Oh, I just wonder. Cowen and Tabarrok are authors of an introductory textbook that I am willing to endorse, at least on the micro side. They also blog at Marginal Revolution. In Introductory Microeconomics, we have been discussing trade. We all know that Adam Smith wrote that trade was a result of people’s “propensity to truck, barter, and exchange one thing for another.” But did you know that he also wrote “Nobody ever saw a dog make a fair and deliberate exchange of one bone for another with another dog. Nobody ever saw one animal by its gestures and natural cries signify to another, this is mine, that yours; I am willing to give this for that.” (Wealth of Nations, Book I, Chapter II) This video calls all of that into question, it would seem (thanks to Adam King). On a related note, listen to this podcast from NPR to get an interesting perspective on early trade (thanks to Max Randolph).